We're back! 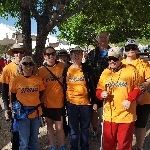 Lettes Fight Stigma team for NAMIwalks Southern Arizona has been revived and I hope you will all join us/support us. NAMI-Southern Arizona has had significant funding cuts over the last 2 years, but continues to provide support, education, and advocacy through programs that are no cost to the participants. Donations are more needed now than ever. Thank you.